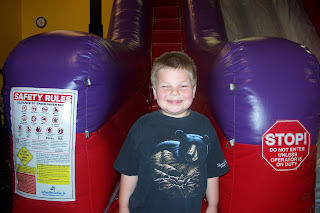 A dear friend of mine invited the kids and I to a night at Bouncin Kidz. Who would of thought to create a play area full to the brim with inflatable jumpy things. After paying, we were instructed to go into 'Area A'. When we opened the door and entered inside, the eyes of my five year old were bulging out of their eye sockets. He was hooked. However, when he actually got in front of the inflatable slide, he was overwhelmed by the vastness of it and decided to sit with the talking mothers. He didn't stay for long. The pull was just to great to resist. He found an inflatable ball about the size he is and enjoyed playing with that for quite some time. Finally, between his older brother and sister, he was persuaded to give the jumpy things a try. I only saw him briefly after that, his face rosy red and his hair wet from running from one inflatable to another. To add to their fun, 'Arena B' which is connected to 'Arena A' was opened up also. What is more fun than one room full of jumpy things?? Two rooms of jumpy things! My most favorite part of the evening was not only talking with my friend but the moment she decided to join the kids at the top of the slide and let out a squeal as she slide down the slide. All I have to say is.....Mom's Night Out???? I'm joking of course, I don't think I could give up my coffee but it would be an absolute scream to see certain somebodies giggling hysterically while they slid down the slide or bounced in the moon bounce. It really would be something to see and to blog about **snicker, snicker** ! Time after time after time, I find myself wondering why we even bother to mop the floor, clean the toilets or even fold laundry. In two seconds flat, one of the darling babes that live in this home have what was done undone without any effort at all. I realize there is this thing out there called Murphy's Law....my children like to put their own personal spin on the 'law'. 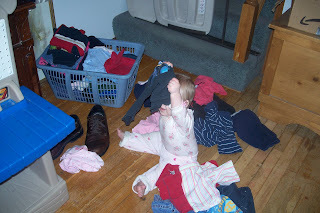 Would you ever have guessed how absolutely fun it is to pull the newly folded clothes out of the basket and see what the responses from the adults in the house sound like....and let's not forget the responses from those who are not currently adults that were asked to help refold the clean clothes. But she's just so cute! How could you be frustrated with such sweetness?? I was recently standing in line at the grocery store to purchase my cartful of groceries when several people all kind of congregated together talking about the unemployment state Michigan is in currently. Of course, it was very obvious to me that Governor Grandholm was not at the top of their 'favorite people' list. This group went around giving their unemployment story to each other. Most of their stories centered around the auto industry. I thought it was kind of amazing that right there in the grocery store that this group found a kind of like support group in each other for a brief period. It was so sad to hear how long many of them have been looking for work. I was so thankful that our family had not been touched by unemployment. My husband showed up around lunch time today. I thought to myself, uh oh...look to see if he's smiling or if he has his mad face on. The kids assured me he was smiling so I allowed relief to set in and quickly dismissed his early arrival home as maybe he has a long conference call that his boss was allowing him to take from home. As he entered our home, the inquisition began. He responded with the fact that he no longer worked for EDS. Shock flooded my mind. How can this be, I asked myself? He just got back to work from being off for his surgery. Then of course, other questions started zipping through my mind. This is NOT a good time to be finding a job was screaming inside my head. What are we going to do? He just hugged me and assured me that everything was going to be alright. You know in the movie, Braveheart, when Mel Gibson is about to be beheaded and he yells at the top of his lungs...FREEDOM. That's Bob. That's how he illustrated today at the office. His boss mentioned something about RIF (reductions in force) yada yada yada. However, I find it very coincidental that he's back to work for less then a week after being on short-term disability due to his previous health issues and now find they are letting him go. So it's great you have benefits just so long as you never have to use them? When he was off work last year for his ankle surgery, they weren't happy either and it reflected in his review. I'm sure his medical time off, has something to do with this too. So now we've joined the ranks of many others.....unemployed. On a good note, his boss gave him a letter of recommendation which I have no idea whether it will help him find a job or not but at least, it's something. We've got some big decisions to make in the near future. Please pray for us that we will have wisdom in those decisions. If any of you caught the local news this past week, you might have seen a report on a 13 year old boy that was out skateboarding with some friends in the middle of the night. He was killed when a drunk driver on a suspended license hit him sending him right out of his shoes. Then proceeded to take off... adding 'hit and run' to the list of offenses. Fortunately, he was caught and is now in the Wayne County jail awaiting his trial. We attended the heart-wrenching visitation last night as this is a relative of ours. A cousin. We lost touch through the years through divorce making this all the more sad. They lived with us for a couple of weeks when they lost their home before moving in with my Mother-in-law for a time. Jonathan was two at the time. I cannot believe that eleven years has gone by just like that. What do you say to parents who have lost a child or to a Grandfather who has lost his Grandson or to a four year old brother who wants to put on his Power Rangers cape so he can fly up to heaven to get his big brother? It is so hard to make sense of such a senseless tragedy. The hardest thing is, what do you say to someone who doesn't know the Lord in a time like this? I can only pray that through all this that somehow their hearts turn towards Christ. He is the only one who can fill their empty hearts with the peace and comfort they need right now. 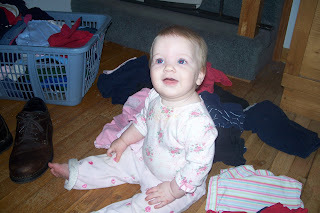 Twelve years ago and some change, we got a call from my sister-in-law. She was pregnant at the time and wanting to name her baby's middle name after my husband. 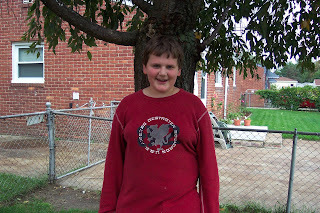 Matthew joined our family in the cold month of January and has had the pleasure of growing up with all of his crazy relatives. About a year ago, he was diagnosed with ADEM. It is a neurological disease that affects the brain. He spent lots of time in the hospital while they administered a steroid treatment. He recovered and has been doing pretty well until recently. He was prescribed an MRI. Upon getting the results of that test, he was sent back into the hospital. Apparently, a percentage of patients who are diagnosed with this disease end up with Multiple Sclerosis which is what the doctors now think he has. He will be going to Children's Hospital today for a consultation. Please pray for them as my sister-in-law has her own physical disability and is a single Mother trying to make ends meet. They have a huge financial need which now is going to include a car to transport him back and forth to doctor appointments and such. I'm sure everyone has their very own personal story. For me, I've got a lot stuff floating around in my head wanting to come out. So this is a creative outlet for me. I was blogging before blogging became popular, sending out emails with life stories as they happened here, to all who would listen. It also let's me get down the crazy things that happen in our life. So I guess it's also like a journal, a biography and a scrapbook all wrapped up in one. It also is like my very own therapist. I can say whatever is on my heart and in my head all while notes are being taken. Why do we read blogs? Some read blogs because their friends strong arm them into it. Some are just interested in what's going on in the lives of those that blog. And others just like to have something to read and what is more fun than reading about real life? I've read some on computer technology, video gaming, coffee drinking experiences, life according to pink and my personal favorite....personal life stories. You can blog about anything. Anything that inspires you. I recently listened to a sermon on 'What is your Passion"? I believe that God put that in all of us. It is different for everyone which makes us all unique. Passion is linked to our gifts and talents. I think I am happiest when I'm using those gifts and talents passionately. One of the reasons we homeschool is to be able to hone in on each of our children's passions and equip them with the skills to develop that into something they can use for the rest of their life. Have you ever come across someone who is absolutely miserable because they've found themselves in a place they've grown to loathe. A place where they just robotically go from one thing to another. It has removed the passion, inspiration and life from what they are doing. We don't want this for our children. Now, at some point, they will have to make that choice for themselves but it won't be because we didn't give them a foundation to work from. Our oldest is very passionate about video games. It is not only an enjoyable pastime for him. He finds it interesting and wants very badly to learn how to create them. Last week, my husband found a free software program that helps you build your own game. Brad's eyes lit up like fireworks in the sky, the energy surging from his pores was oozing into the atmosphere as he awaited the installation to his computer. He spent the entire day working on one. Now this is just an elementary place to start but who knows what it will bring in the future. My favorite part was when he stated to me that he needed to work on his math so that he can get better at programming. Ahhh, it does a Mother's heart good! Our second child is very passionate about art. She loves to draw and create projects out of nothing. To watch her in action, is simply amazing. God put this in her! She has loved it since she was able to pick up a crayon. People will tell her she will probably be an artist someday and she replies with, "I already am!" She's not being snotty, she just knows what she is. Our third child is passionate about life. His exuberance vibrates from the very top of our home to the foundation that it stands on. His mind thinks like no other and he has me in stitches many times throughout the day. Perhaps he'll be our comedian or write his own book. He can tell a story ad lib and it can keep going and going and going longer then the Energizer Bunny Rabbit can beat his drum. Our fourth child is very rule oriented. He does not like things to be as they should not be. He is very passionate about this and will tell you what he thinks. Perhaps he will be our engineer. At eleven months old, our fifth child is already showing signs of 'independent thinking', which we encourage in all of our children. She knows what she wants and she loves to squeal. I think she may make a great project or program manager someday. Our hope for ourselves and for our children is to find ourselves passionately doing things that God created us to do in our job, in our home and in this world that inspires others around us. We all want to live life alive and with gusto so that not one moment that we've been blessed with will be for nothing. So, what is your God-given passion? I just want to know this one thing. Does anybody realize that as a mother of five youngsters, it is imperative for her to eat on occasion??? I must get my eleven month old situated in her high chair with something to nibble on (a decoy since she has decided she likes sitting on my lap and sharing above-mentioned toast). I must get up every two seconds to settle a squabble, change poopy diapers at various intervals because they are NOT in unison, get drinks, snacks and kiss boo boo's. I must make 'second' breakfast for my three year old who says he needs more food. I must also wear a pathway on the floor between the kitchen and livingroom, putting the TV back on the proper channel or lowering the volume to a normal level since Kara has found buttons she loves to push which totally upsets certain other little people. How upsetting it can be when your program gets switched right when you are about to find out if Swiper swipes something that Dora needs? That is very disturbing indeed! There is the endless, I need a dwink. I need a different fork. I need my food cut up and ranch or ketchup put in just the right spot. Find something for Kara to eat. And then finally when everyone is happily eating, I turn around to sit at our table and glance over at everyone realizing once again that we must eat in rotation since there isn't enough seats for everyone. I, being the waitress, have lost my window of opportunity to find a seat in the process of accomplishing all that must be done before I can partake of the 'hot' food. I have been bumped to the 'waiting' list. ....just so I can sit (instead of stand) and enjoy my luke warm meal while they are preoccupied and not needing me for a brief moment in time. It's called survival. Thursday was "T" day (test day). After registering and finding out where we had to go, we arrived at the radiology room. A HIDA scan was scheduled. This is the test where they shoot some radioactive tracer into your arm and then watch it go through your liver, gall bladder (if you have one), intestines and pancreas.....and just as a bonus, you get to watch it do all this on the screen. Your organs light up quite nicely as it moves along. Of course, to one who isn't skilled in reading the screen, it might seem a little un-nerving as you begin to wonder why everything looks a little bulgy and funny shaped. And then you wonder, if your eyeballs would glow like two little beady eyes in the dark of night. Hmmm.....that might be fun to check when Kara gets me up at 2 a.m. I need to find some amusement for being up at that time of morning, otherwise, I might just be cranky. This particular tests can take from an hour to four. Last time he was in the hospital, the doctor thought it would be nice if he took the four hour. What a long test! 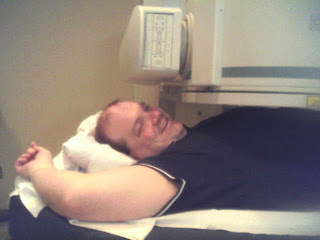 However, since they were just checking things out as a precaution this time, he only had to lay there for an hour....long enough for me to amuse myself with my camera phone taking pictures of Bob laying there trapped under the machine with no escape. We then had to make our way over to the lab for seven vials of blood to be removed from his arm. After all this is said and done, I wonder if he might feel like a test specimen. However, no animals were hurt in the process of finding out the mystery. For many of you, you've already heard our news but I'd thought I'd share it with the rest of you. Bob's tests all came back clean as well as his blood work. His doctor thinks his spleen is alright. His blood work did not indicate any problems that usually are present when something is wrong. Perhaps his spleen is just bigger than some as people are all different shapes and sizes. His happens to be a millimeter of an inch bigger on all sides which according to her is only slightly enlarged. However, he will have to go have another CT Scan in 3-6 months just to make sure it's not getting any bigger. As far as him still not feeling well from his surgery....they think he probably just has a lot of fluid buildup that just has to work it's way out. She also mentioned that she had to do some repair work on his umbilical hernia that he had when he was a baby. No wonder he walks around holding his belly and feels every bump and defect in the road when he's in the car! If he's not feeling better in a few weeks, he will then have to go through some more tests but for now, medication is his friend. We are trying to rest this weekend and get ready for his return to work on Monday. Somehow in the midst of all this, he is going to have to try, with pain meds, to function at work. I am going to have to try to function, without meds, at home. A couple of my children mentioned at breakfast this morning that how awful it was that the worse things keep happening to us. I quickly responded to them that we need to keep perspective on things. They have no idea how 'worse' things really could be. We need to be thankful that even though we've gone through a bit of a roller coaster ride of emotions, the end results are things we can handle. We can handle a flood, a bad ankle, and a mysterious gall bladder. All these 'detours' that happen, are all useful in helping us grow in character, in patience and in understanding of others. I do pray that God allows us to have a bit of a 'resting' period before he throws us another 'detour'. However, I'm ready to 'rest' in His presence, should something else be thrown onto our path. Our strength comes from the Living Water, Jesus Christ. As I was contemplating life and all it's recent events, I was going to title this blog 'Roadblocks'. However, the more I thought about it, the more I thought that that title didn't really apply. Here is my thinking on that. When you are driving down a particular road and run into a road block, typically it steers you back where you came from. I don't want to go back where I came from, I want to learn from that and keep moving forward. Then the idea hit me! I should entitle this blog as 'Life's detours'. We are still moving forward, maybe in a different direction then we originally planned or maybe it takes us a little longer to get where we are going since we perhaps have to go around curves, valleys, hills or slow drivers in front of us, but nevertheless still heading to our destination. Hence...my title. Yesterday morning we received a phone call from our primary care physician. They had test results. Bob was still sleeping and I didn't want to disturb him and they really wanted to talk to him about it. I thought to myself, that's a little odd since it's been a month since his surgery. Does it really take that long to get results to your doctor from the hospital? But I quickly dismissed it as they probably were just going to tell him that his liver enzymes were up which we already knew. After Bob woke up and cleared his head, he made the call to the doctor. They told him the doctor was looking at his CT scan and found an enlarged spleen which they wanted him to get checked out right away. Ok, I thought to myself, this isn't what I was thinking. I started feeling nauseous. This is what I do when things like this come up. It's either nauseousness or a feeling of complete exhaustion overwhelming me. On this particular day, both are hitting me. The surgeon that recently took his gall bladder out, has scheduled him for a gamut of tests which we originally thought was going to happen today but couldn't get him appointments for that until tomorrow. They also want to check out why he's still not feeling well from his previous surgery. So we will be spending the day at the hospital tomorrow, the day he was scheduled to go back work. I'm sure they, meaning his boss, is NOT going to be happy about that. This has been a doosey of a year already and it's only April. I was sure that once we got through his mystery of a gall bladder, that things would level out but I guess life doesn't necessarily work that way which leads me back to my contemplation of life's crises'. I was thinking that one can be traveling along and BAM! you have a severed ligament in your ankle to deal with which sends you on a 'detour' or BAM! a flood hit's your home and again, detour or BAM! health issues suddenly come up...again...detour. How do we deal with detours? Some may get mad or frustrated because we don't have control over situations that we have to deal with. Some may embrace it and get excited to see where it may lead them. Some may shake their head in disbelief. But really, how do we deal with these crazy detours because we all have them? I personally hate the emotional roller coaster I put myself on. I tend to fall apart on the 'what if's'. I wish I could maintain a level of calmness until a determination has been made. And why does all the symptoms you have usually lead back to cancer? I am so thankful that God places special people around you to hold you up, to encourage, to do whatever God puts on their heart that will minister to you. They are reminders that God is there. He does care about what you are going through. And He gives you the strength to get through it. And He uses his people to accomplish all this. I am always awed when He calls me to be one of those people, an ordinary Mom to five beautiful children.